The constant breeze off the island of Bermuda makes for great sailing. In the background you can see the white roofs of the cottages and the tropical vegetation silhouetted against the sunset. One of the days I spent with my sisters in Bermuda, we went for a ride on a glass-bottomed boat. First we took the ferry to Hamilton, the main town. Since we'd arrived early for our boat excursion, we went to see the boat Bermuda Sister had hired. Even though she's lived there a year, Bermuda Sister had not seen some of the attractions until her two sisters arrived. I guess it's like that with most people - when you live in a place, you're not a tourist. We found what must have been the boat but it was SMALL...just a little bigger than a rubber raft and it looked like a motorized raft with a blue canvas roof. A young kid was standing on the dock and asked if we were taking the trip. No one else had arrived. He looked too young to be the captain - he said he was co-captain and opened up his wallet to collect our money. But Bermuda Sister is savvy, having worked in New York City for years before marrying a Bermudian. She wasn't sure if he was for real, or just someone hanging out at the docks and collecting people's money! She told him we would do some shopping first and come back in a bit. When we returned, the Captain was there, a gray-haired gent with a captain's hat. Also, there were other people boarding the rubber boat - it could hold about 10 people. The young kid, Dominic was helping them board, so OK, he was legit. We got on. Another little fellow came along to help out, also named Dominic. It was a great trip. The Captain was full of information and took us on a tour around the island pointing out celebrities' homes and regaling us with stories. Dominic drove the boat for most of the trip. When it was time to go out to the coral reefs to see the fish through the glass bottom, the Captain told us to hold onto our hats, dentures, glasses or anything else that might blow away because Dominic was going to take us for a ride. AND DID HE EVER! He drove that little boat so fast that it was difficult to sit upright the wind was so strong. I looked back at the Captain and he was sitting hunched over, his head down on his knees and his hands over his head. He had full confidence in Dominic so I wasn't worried. Dominic came through. He got us out to the reef in record time. We sidled up to a shipwreck (there are many shipwrecks because coral reefs ring the islands). There the doors to the glass bottom were opened and we feasted our eyes on the coral and the fish below. The two Dominics threw food over the side and fish leaped up to eat it. Overhead, another wonder... a pair of Bermuda Longtails - white-as-snow birds which live most of the year on the Sargasso Sea only coming in to land during nesting season and nesting only in Bermuda's coral cliffs. They are named Longtails because of their long thin tails. We were there at the right time of year to see them. Their bellies looked turquoise reflecting the waters of Bermuda. So much beauty. My camera was working overtime! 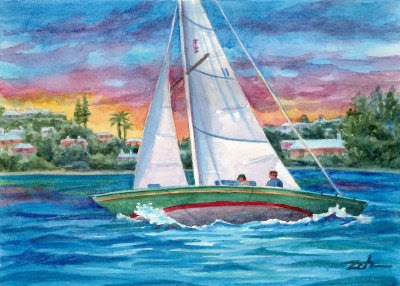 On the way back, I snapped some pictures of sailboats one of which I used as a reference for this painting. This painting is #8 in a series of original Zeh paintings called the BERMUDA COLLECTION.